Background: Vascular calcification is known to be a strong risk factor for cardiovascular adverse events and mortality. Atherosclerosis, diabetes, aging, abnormal bone mineral homeostasis and high uremic milieu such as chronic kidney disease are major factors that contribute to the progression of vascular calcification. Several mechanisms such as the osteoblastic transition of vascular smooth muscle cells in response to oxidative stress have shed light on the active nature of vascular calcification, which was once thought to be a passive process. The fine interplay of regulatory factors such as PTH, vitamin D3, FGF 23 and klotho reflect the delicate balance between vascular calcification and bone mineralization. Any disturbance affecting this equilibrium of the bonemineral- vascular axis results in accelerated vascular calcification. Bisphosphonates share similar mechanism of action as statins, and hence several studies were undertaken in humans to verify if the benefits proven to be obtained in animal models extended to human models too. This yielded conflicting outcomes which are outlined in this review. This was attributed mainly to inadequate sample size and flaws in the study design. Therefore, this benefit can only be ascertained if studies addressing this are undertaken. 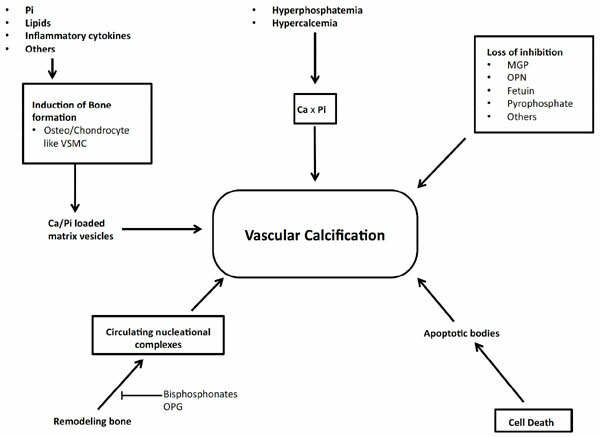 Conclusion: This review seeks to highlight the pathophysiologic phenomena implicated in vascular and valvular calcification and summarize the literature available regarding the use of bisphosphonates in animal and human models. We also discuss novel treatment approaches for vascular calcification, with emphasis on chronic kidney disease and calciphylaxis. Vascular calcification, bisphosphonates, chronic kidney disease, bone-mineral-vascular axis, statins, osteoblastic transition, calciphylaxis.